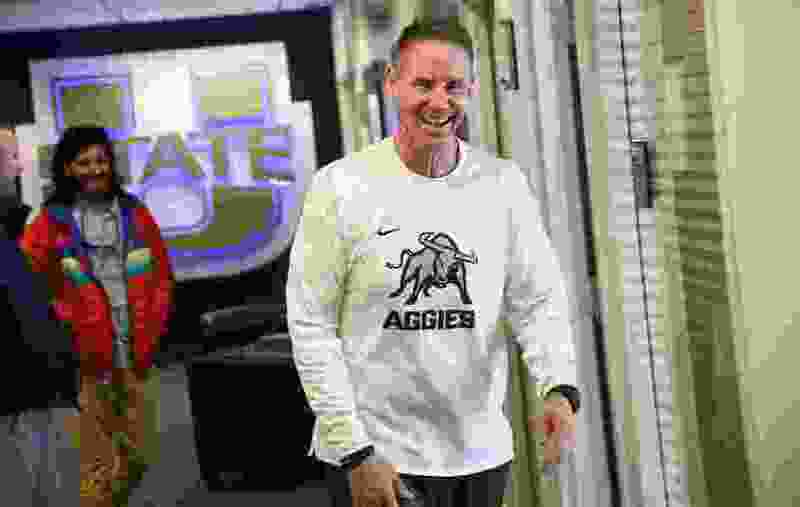 (Francisco Kjolseth | The Salt Lake Tribune) USU coach Gary Andersen jokes around with staff as he walks the halls of the Jim & Carol Laub Athletics-Academic Complex. The excitement in Logan isn’t tied specifically to what’s going on with Craig Smith and the NCAA Tournament-bound Aggies. On Tuesday afternoon, Round II of the Gary Andersen era in Cache Valley got underway. The Utah State football program opened spring practice on a sunny afternoon in Logan for the first time since Andersen returned to coach the Aggies in December. The Aggies are coming off an 11-2 season in 2018, including a runaway 52-13 win over North Texas in the New Mexico Bowl. Of the 91 players at Tuesday’s spring opener, nine are returning starters, including seven on defense. Returning in 2019 will be two All-Americans and eight players who earned various all-Mountain West Conference honors from the team that finished No. 22 in the final AP poll. "It was a great day with good effort and energy, which you would expect on day one," said Andersen. "Overall, I'm proud of these kids and there hasn't been one day where we haven't had effort. You always have a long way to go, I don't care how experienced or inexperienced of a team you have on day one of spring ball. There's a lot of new faces and we're doing a lot of new things on both sides of the ball." Notable returners include junior quarterback Jordan Love, junior linebacker David Woodward, junior wideout Savon Scarver, senior linebacker Tipa Galeai, senior defensive end Fun Leilua, senior defensive tackle Christopher ‘Unga and senior defensive back DJ Williams. Love set five USU school records in 2018, including 32 touchdown passes, 3,567 passing yards, seven 300-yard passing games, 234 points responsible for, and was named MWC Player of the Week five times. "It was good to be back out here and everybody was flying around," Love said. "We are keeping the same offense, so we don't have to learn much, we just have to keep getting better." The Aggies are scheduled to have 15 spring practices during the five-week-long period, culminating in the annual Blue vs. White spring game on Saturday, April 13, at Maverik Stadium at noon.